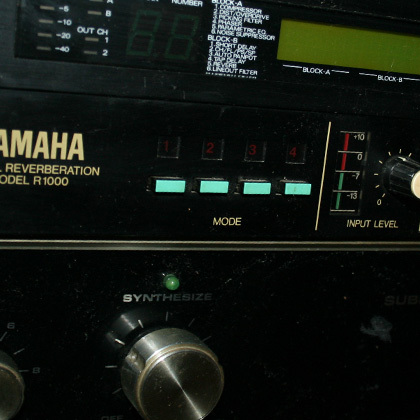 First manufactured in 1984 as a cheaper alternative to the professional reverbs on the market at the time, the Yamaha R1000 brings high performance digital signal processing to a highly versatile digital reverb unit. In its heyday, it was the chosen reverb to use for live performance because of its affordability, durability, and simplicity. The Yamaha R1000 could be found in use inside many famous guitarists live rigs, from The Edge to Eddie Van Halen. The Yamaha R1000 controls are not only simple, but offer flexible operation too. Direct and Reverb sound can be varied continuously in any of four different reverb time settings, and input/output levels adjusted for compatibility with peripheral equipment. For precise acoustical control of music sources under a wide range of conditions, a three band parametric equalizer enables continuously variable adjustment at low, mid and high frequency bands. A 4-segment LED meter is also provided to help users tailor input levels to avoid clipping while maintaining a high signal to noise ratio. Starting at the left hand side on the front panel of the R1000, you will find the power ON/OFF button. Adjacent to the power control is the 4 MODE selector buttons. These buttons allow users to select between 4 different reverb presets. Each preset is a larger reverb setting then the previous. Next is an LED input meter accompanied by an input level control pot. To the right of the LED meters is the Yamaha’s 3-way Parametric Equalization section, although without a ‘Q’ control it’s really a fixed sweep equalizer, offering 3 bands of equalization achieved by using 3 X dual-layer pots offering ±15dB of Cut/Boost. The low equalizer ranges between 50Hz-700Hz, the mid equalizer, which shares frequency space with the low equalizer, ranges between 350Hz-5kHz, while the high equalizer ranges between 2kHz-20kHz, sharing frequency space with the mid equalizer. Adjacent to the frequency control is the mix control output, which controls output of the reverb effect, and the direct output control, which controls output of the dry untreated signal. On the back of the unit the mono input and output terminal is an unbalanced ¼ inch socket connection with an input level rated +4dB/-20dB. There is also an insert input & output to allow users to bypass the Yamaha’s internal circuitry when using compressors and other effects into the chain. Though the Yamaha R1000 doesn’t get as much use here at Studio 11 like it did 10 years ago, we still consider it a great digital reverb unit to have lounging around the studio. But when we do call upon its services, the R1000 always comes through. It is one of many digital reverbs that we have in the studio, along with spring, plate, and plug in reverbs. So if reverb is your thing, give us a call. We can wash ya up with plenty of reverb goodness.